Despite a few flaws that can't be helped, The Last Story is an artistic masterpiece worthy of its pedigree. Veteran RPG fanatics, remember back to the old days. Remember when you first played a Final Fantasy game on the Super Nintendo? We all had the same thoughts during those days. We all had wondered what the game would be like if we could ditch the turn-based gameplay in favor of something much more real. Something more fast-paced. Something that would have something other than the cutscenes gripping the edge of our seats with excitement. Boys, your dreams have finally been answered with The Last Story. The Last Story has quite the pedigree behind it. With the legendary names Hironobu Sakaguchi and Nobuo Uematsu on the cover, the creator and longtime composer of the Final Fantasy series, respectively, the game has a lot to live up to. Thankfully, the game manages to step correctly in all the right places, and only falter where it’s largely expected to. After all, as with Xenoblade Chronicles before it, there was a lot of effort put in to trying to get this game localized, so it better be worth all the hullabaloo. 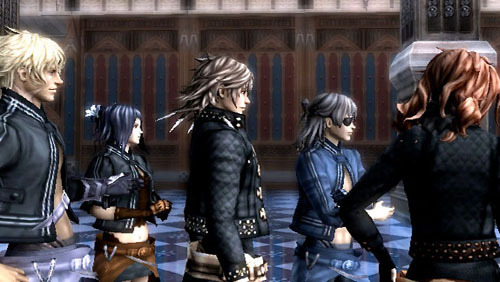 The Last Story follows a group of young mercenaries with big dreams of becoming knights. 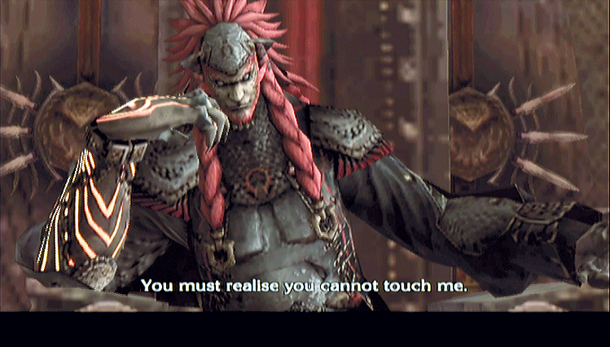 Specifically, you play as Zael, a troubled person with a past he’d rather not remember. The rowdy bunch have finally got the job of their lifetimes. Job after job leading to barely scraping by in life, and finally the gang score a contract working security at the royal castle. It’s there that Zael meets Lady Calista, who quickly becomes part of Zael’s dreams as well. Zael and friends are thrust into destiny when the castle is attacked by the Gurak, a vile race of beings with a longstanding hatred of the humans. Zael is ordered to protect Lady Calista at all costs, which leads into more trouble than it sounds. And to make matters worse, Lazulis Island is slowly dying due to unknown causes. However, Lady Calista thinks she knows the reasoning, and asks to be escorted while she confirms her suspicions. The storytelling is really what makes the game shine the brightest. While a handful of JRPG cliches remain (such as the multiple final boss stages and the protagonist with a tragic past), much of the game feels new. 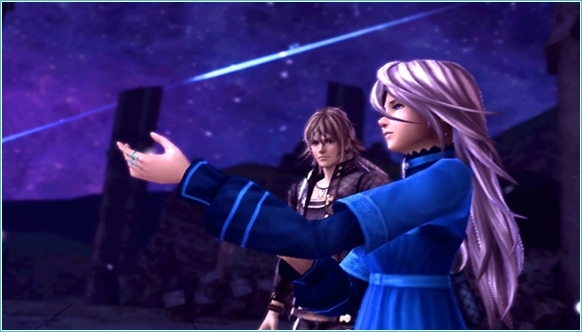 None, or at least very few, of the main characters fit into any of the archtypes usually found in JRPGs, instead choosing to break the mold with new personalities. The story itself is much deeper than the typical “looming darkness wanting to control everything” that we’re all sick of. There are twists and touches on politics, personal overcoming of emotional obstacles, struggle between teammates and even a bit of romance can be found here. All of it manages to be paced fairly flawlessly, especially considering that’s something that JRPGs usually struggle with. Even the length of the game manages to feel refreshing. The game is shorter than most JRPGs, clocking in at around 20 hours, but that’s because the game never bogs you down with needless grinding or sidequests. Before you panic over the last statement, yes, you can choose to grind if you like, and there are definitely sidequests, but they’re disguised as regular missions as to not feel completely unnecessary. The game itself is narrated as if you’re being read a book, and split into about 44 chapters. Each chapter takes between five minutes to a few hours to complete. Each main quest and side quest is listed as a chapter, meaning this is a great way to gauge how far along you are and if you’ve missed anything. A great example comes from the middle of the game in which I had returned to the city after a particularly long story arc. I ended the arc on about chapter 21, did an obvious side mission involving a kidnapped girl numbered chapter 24, and continued the story at chapter 26. It’s a tad disorienting, but as I said, a great way to tell where you are in the game. The fresh air continues with the combat. 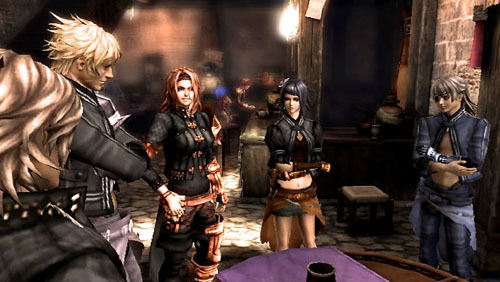 Although the game is an action RPG at its core, there’s a lot of things that make The Last Story particularly unique. Most notably the fact that the same kinds of cover system and squad commands you’d find in a Ghost Recon game are present here, a game in which almost all combat is done with swords and magic. Do yourself a favor when you boot up the game, however. Go into the settings and change the combat style from “normal” to “manual.” Normal essentially means you’ll automatically attack when in range of an enemy, and manual means you actually have to hit buttons to swing your weapon. You’ll find yourself bored very quickly if you let the combat happen automatically. At the beginning of each combat scenario, the game goes into a quick overhead view of the entire battlefield ahead of you, allowing you to strategize and form a plan of attack. You usually have the command of yourself and an additional five squadmates or so, which makes battles all that much more exciting. Strategies will be familiar with most people; it’s usually wiser to take out healers first, leaders are important to slay quickly considering the buffs they give to nearby comrades, etc. The traditional elemental resistance and weaknesses are present as well. Although your squadmates are usually well off on their own, commanding them in certain situations can be incredibly beneficial. For example, if you have an enemy that’s weak to fire, getting Yurick to cast one of his fire spells would probably be a wise choice. If your whole party isn’t doing too hot, having Calista cast a healing spell is crucial. Each character comes with their own set of spells or, for the magically challenged, special abilities. Zael’s Gale allows him to quickly bolt to a specified spot on the battlefield in a gust of wind, dispelling any of the circles laid on the ground from a cast spell and causing extra effects, such as casting silence or breaking an enemy’s guard. Syrenne’s Power Chain allows for a string of moves that are more powerful than normal. Each character also has a special, momentum-changing move, activated by gaining SP with each successful attack. Calista’s places a protective shield around Zael for a limited time, Mirania revives all party members at once, Yurick casts a massive fireball, etc. Should you fail to subdue your enemies, never fear. You’ve got five lives per area. Should you fall, you’ll simply get back on your feet in a few moments, provided you still have a life left. Once all five lives are gone, you’ve got to restart at a save point. Your teammates are simply knocked out if they lose all their lives, and are resurrected at the end of the battle to fight another day. However, you can revive fallen enemies through Zael’s last strategic move, the Gathering power. Gathering, a power that Zael is somehow bestowed at the beginning of the game, lights your right hand up like a Christmas tree, and draws the attention of all the enemies in the area. It’s like instant aggro if you need to distract your enemies while your friends flank a group of enemies or if you’re waiting for someone to get through their casting time uninterrupted. Gathering gets much more useful later on as you take on powers such as absorbing health while it’s active or letting the damage that you rack up go towards a semi-powerful area attack. All of the previously mentioned go into strategically making it through each battle with minimal worry. Although the game is never terribly difficult to begin with. Combat work well for the most part, but things can get hectic when you’re surrounded. Particle and spell effects blind you, but aren’t nearly as annoying as the game’s single most annoying con: framerate drops. You see, The Last Story has the unfortunate fact of being exclusive to the Wii, the most graphically unimpressive console this generation. And while the game has parts that may be some of the best looking ones on the console, it comes with a price. Players will encounter frequent framerate drops. This doesn’t just happen during battles when there’s tons of stuff going on; that’s just when it happens the most. No there were several times where I might just be walking along a cliff or in a cave and I’d start to see things stutter a bit. It’s not so bad that it makes the game horrible, especially if you’re like me and you manage to convince yourself it’s an artistic thing, but it’s an unfortunate reminder that the game could have been a true masterpiece had it been on the PS3 or something. You’ll occasionally see bland textures and low-poly enemy models, but again this is due to the console the game is on, rather than any laziness on the developer’s part. Thankfully, everything audibly is spot-on. Voiceovers are masterfully delivered and very believable. The score, as mentioned composed by video game music legend Nobuo Uematsu, will live up to the expectations of anyone familiar with his work. The main theme itself is so damn catchy that I instantly had to figure out how to play it on guitar after hearing it. If you were lucky enough to be an early adopter, then you’ve got a sample of the soundtrack anyway, so you’re good to go. It’s also worth noting that the game does have online competitive multiplayer that pits you against five other players. 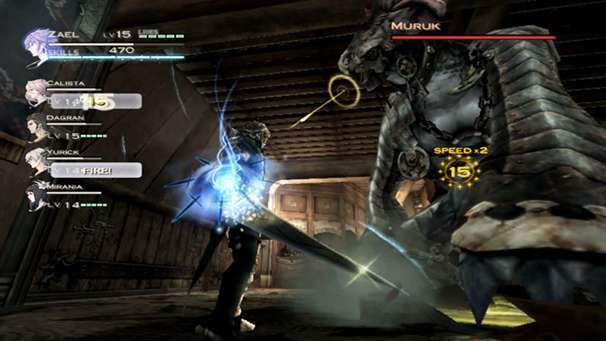 There’s also a co-op mode in which you and five other teammates work to take down one of the many bosses in the game. These work okay, but you’ll likely never play them. No one is going to buy The Last Story for the multiplayer. So now comes the time on whether or not I tell you if the game is any good. By this point, you’ve already figured out how much I love the game, but regular readers should know that isn’t a surprise by any stretch. What I can say is The Last Story is for fans of the people who’ve made the game. The game manages to feel completely brand new and nostalgic at the same time. It’ll renew your love of JRPGs by giving you all the same feelings when you first popped in Final Fantasy or Dragon Quest so many years ago. The game is an artistic masterpiece for anyone willing to forgive a number of flaws that really can’t be helped anyway. In the end, by the time the credits rolled, I was only disappointed that the game had, in fact, ended. I love this game. I found myself smiling while playing almost all of it. That’s a feeling that not many get with games, and not one that I, who’s played more games than I care to remember, gets with any amount of ease at all.